I recently came across this work by Dutch art graduate Wies Prejide and was amazed when I discovered that it was actually made of fabric! It looks so much like line drawings – admittedly this is what attracted me to it in the first place -and creates a wonderful sort of optical illusion that renders its scale unimaginable. It was only when I saw a picture of someone interacting with the work that I could place it in my mind and imagine the structure surrounding me with its paper thin walls that seem to stretch around invisible corners. Prejide studied Textile Design at the Royal Academy of Arts in The Hague, which is one of the oldest academies in Europe. The Hague is renowned for producing talented artists and designers and Prejide is yet another shining example. The whimsical coloured threads spread like light across the space and act as dividing walls guiding the viewers around, over and through. The woven screens were hung on walls and stretched between beams at the degree show, casting colorful shadows and creating a trompe l’oeil effect. Wies Prejide said: “The textile walls make the existing space divisible, but also create optical transparency and spaciousness by the experience in perspective. 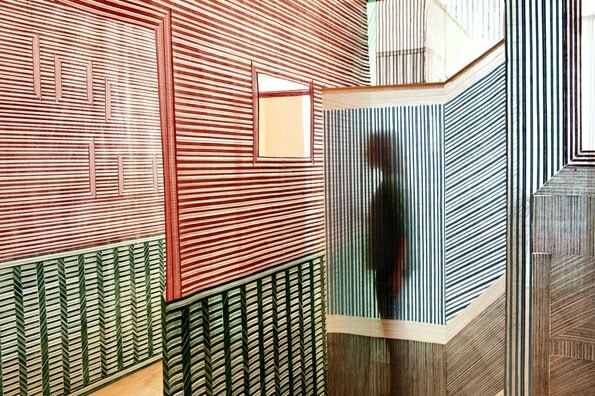 Through a combination of lines, color, views and passageways give spectator the idea of a transparent walking home.” It is fairly reminiscent of works by artist such as Tomma Abts and Bridget Riley who both use colour, tone and geometric forms to create illusions and patterns that hypnotize the viewer. It could also be suggested that Prejide’s work has been influenced by the Cubist movement, with its strong emphasis on experimentation with form. During her time studying Prejide came to the conclusion that through the design of new materials and the process of making, new forms will always be discovered. You could say that perhaps the best way to discover new ideas is not to try but to simply let it happen. Different objects inhabit different spaces such as the wall or the floor and are therefore made of different materials, which imbue them with their function. Prejide knows how to translate these functions into her work and also finds inspiration from rhythm, which helps to form the basis of her patterns. The textures and shapes of everyday life are also key, especially those experienced through architectural forms. She uses these ideas to begin the process of making new textiles transcribing different textures into the language of pattern. I am in awe of her work and cannot wait to see if she becomes a wonderful textile designer or an inspired new artist!